Private Stock 7009. Emotion 1978 LP Emotion includes title track, You Keep Me Dancing, Charade, Change of Heart, Living Without Your Love. Produced by Barry Gibb. Title track written by Robin and Barry Gibb. 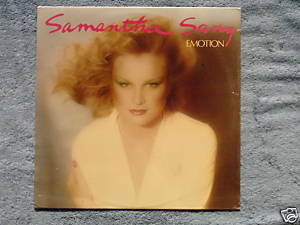 Samantha Sang, an Australian vocalist, toured with the Bee Gees, the Hollies, Herman's Hermits. Sealed LP with tiny sawcut at upper right; cover is VG.